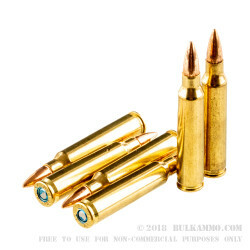 These .223 Remington rounds from Federal use a boat-tailed bullet for accuracy at extended ranges. Each cartridge fires the 55-grain full metal jacket bullet at a muzzle velocity of about 3,240 feet per second. 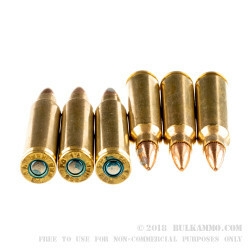 This ammunition comes packaged 20 to a box in Boxer-primed reloadable brass cases and will function well in any firearm chambered for .223 Remington or 5.56 NATO. Federal Premium Ammunition is one of the nation's leading manufacturers of ammunition, particularly the .223 Remington / 5.56 NATO cartridge. 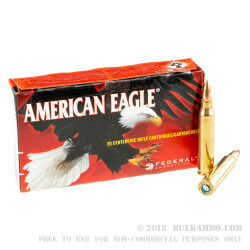 The company's range ammunition offers good accuracy, clean shooting, and reliability at a moderate price. 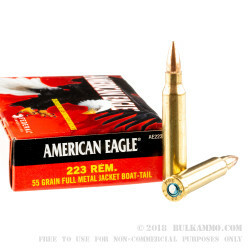 Most Federal ammo is made at the company's headquarters in Anoka, Minnesota, or at Lake City Army Ammunition Plant, a government facility operated by the company to supply the US military.